With only hours left in 2012 and of those few hours I had but maybe two to fish. So I decided to fish a stream I had not fished since perhaps May. I found a place where I could park, lots of snow in the way made that some what of an adventure. 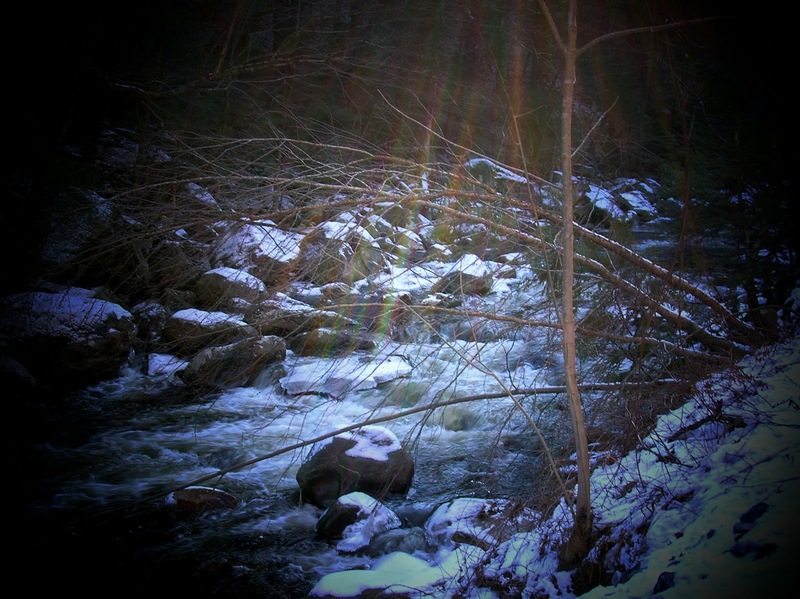 I grabbed the 2wt and started treking through the snow to the stream. The sun was shinning brightly and it felt good. The stream had a bright blue color to it as most streams do when it's cold. As I stepped close to the stream, what I thought was hard ground turned out to leaves covered with snow. Soon I was calf deep in the stream and there was that sensation of cold wet water filling my boot. I pulled my foot out, stepped back on firm ground and continued to fish. 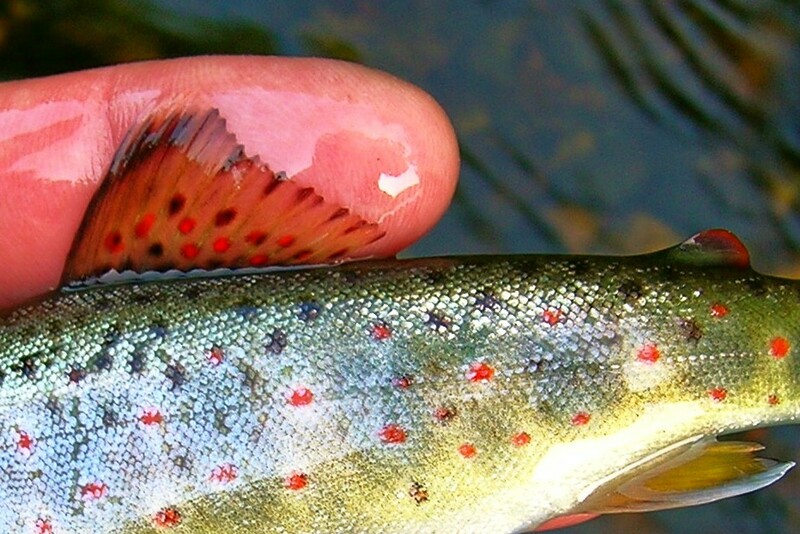 The activity was very slow, most pools and runs brought one excuse me strike to the wet fly. By now my foot was feeling very cold and I knew my time here was limited. A few more pools and home I must head. I had noticed a few of these guys on the snow, and even one on my ear. I never actually seen them coming of the water but they were there. So I was about to tie on a black caddis, it was the closest I had to a stone fly. But the box with those was on the back seat of my car. So I tied on a tan one and sent it drifting into this pool. As the fly drifted to the right of the stick there was a rise. 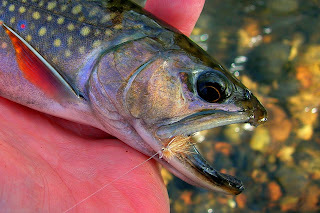 A few jumps and pulls later a brook trout lay at my hand. A couple of photos of this beautiful gentleman and off he went. I was about finished at this point, the cold had taken control of my foot. Now as I walk through the snowy field back to my car a good feeling was there. I had taken a wild brook trout on a dry fly this last day of 2012. I was in need of some tying materials, squirrel tail to be exact so we took a drive to a fly shop I knew would have them in stock. 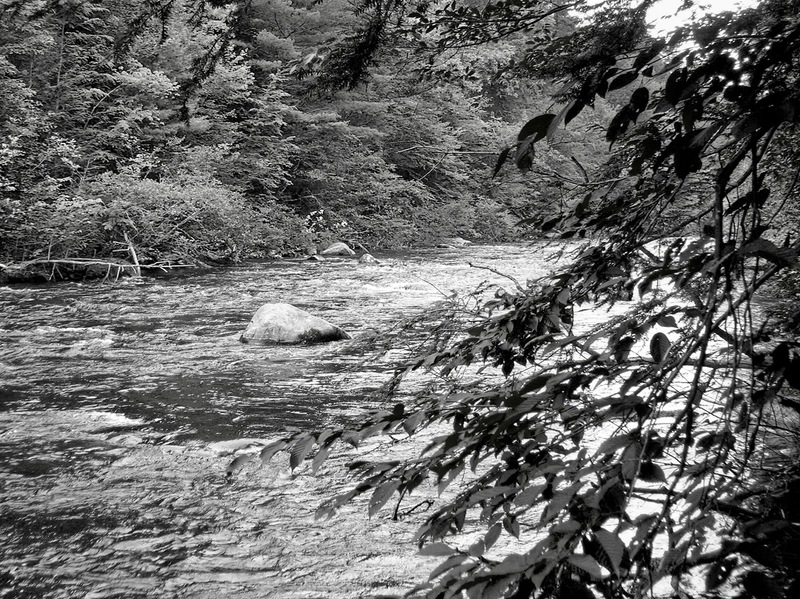 The shop is located on the banks of the Farmington river in New Hartford, Connecticut. After getting my tails, as well as a few other necessities, weather needed or not we continued to drive along the river to its upper reaches. 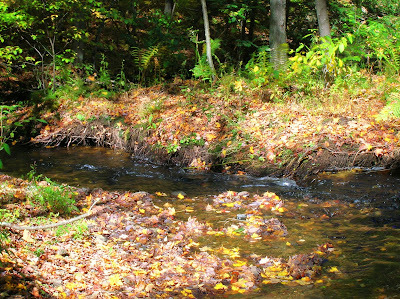 The west branch of the Farmington flows alongside of the Old Riverton Inn. I have never dined here but it is on our list. Across the bridge from the inn is a general store that has some great coffee, and muffins, this is knowledge from experience. The west branch is a beautiful river. And seeing it a few hours after a fresh snow brings out features one can only see in winter. These are a few of my favorite haunts on this river. Big waters that I'm able to fish like a small stream. 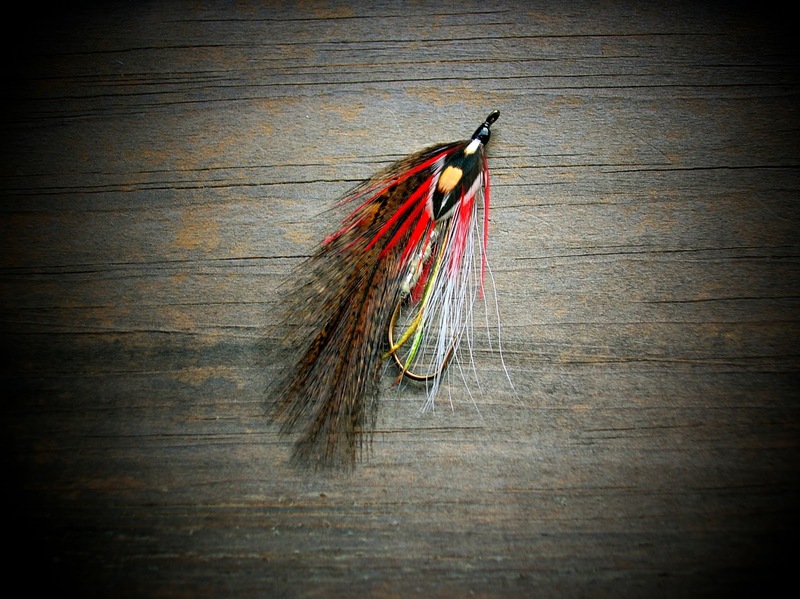 Bombers, caddis, and Picket Pins fished in my own style. I fish this river many times year, but this year I will fish it more often. There's some wonderful wild things going on here. As I'm typing this the snow is falling, and at a good clip. The forecast is for it to continue a few more hours, with the winds to pick up and the temps to fall. Winter is here. After supper I noticed the stack of mail on the table. Looking through it I picked up the Winter 2013 issue of "Trout". As I thumbed the pages I came upon an article named "On the Doorstep", written by Erin Block. I quickly made myself a hot cup of Folgers Black Silk, sat down and started to read the article. Erin is a blogger and many of us have seen her talents, from cane rod making, to her skills as a fly fisher, and her fine writing. 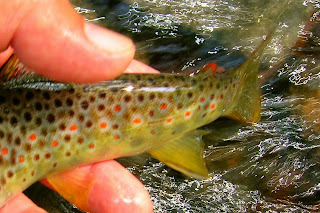 But this article really has special meaning for me, being"a small stream angler". Here are a few lines from this wonderful article....As the aspens start to tinge and the willows dry brown, as the brook trout grow even more color for their spawn; then, winter is on the doorstep. "For hours and hours I am led on by what may be the defining allure of a small stream: curiosity. Whats coming in the next bend, next plunge, next pool. As I finish my second cup, and have read this fine piece for a third time.. Erin thanks. "And winter walks through the door. You can see Erins fine writing at "Mysteries Internal". I had hoped to be able to fish a few hours on Christmas eve day, and when I was given the green light I did not waste any time. My long range thoughts were that this might be the last outing of this year, so make the best of it my good man. 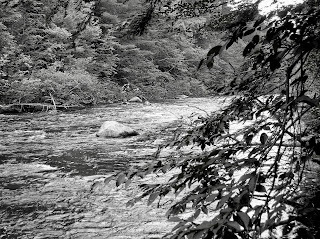 When I arrived at the stream the water level was up from the good rains of the days before. The air temp was cold, and there was a little shelf ice in certain places, telling me the water was cold and the fish were going to be slow to the fly. 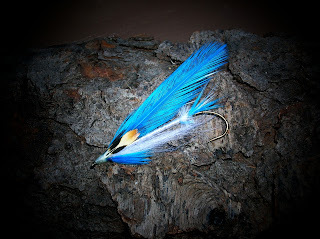 With the higher levels my first fly was a Black Ghost streamer. I fished it very slowly, working the soft seams of the little stream but there was no interest paid. I proceeded to change to a wet fly. 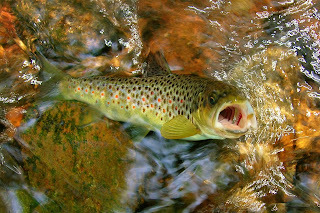 I worked the fly through several long slow pools as well as the soft runs between but to no avail. By this time the sun was making itself felt. While its warmth was a delight on my back, it did not do much to warm the water. I reached a pool with a sharp curve in it. There was also a undercut with lots of roots. As the fly worked through the pool a fish came to it and gently took it. The 2wt did its job and my first fish of the day was at hand. It was a beautiful rainbow. A quick photo and off it went. 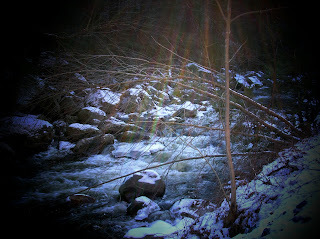 The beauty of this little stream was awesome on this cold day. I continued to fish for an hour or so without a strike. I had noticed a rise or two along the way, but they were halfhearted and not promising. I tied on a caddis dry and fished the little fly. It produced a follow or two but no takers. It was in this deep run, in a soft spot that the caddis was eaten by a brook trout. These were to be my only fish of the day. A really fine day for sure. As I walked to the car my thoughts were of a day filled with accomplishment, and thanks. The air seemed to get colder despite the sun, and the heat in the car was such a good feeling. 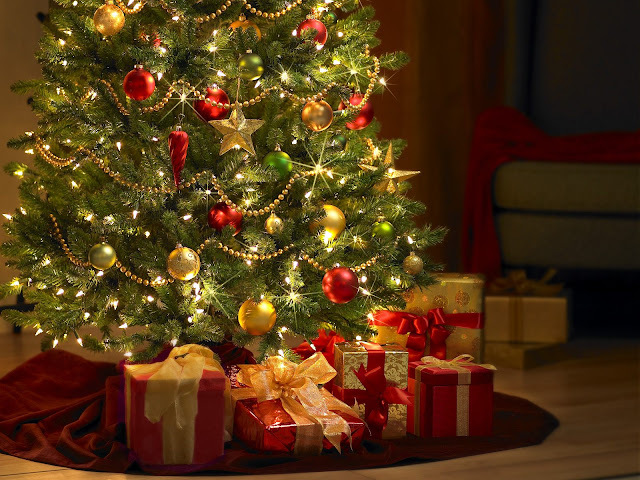 Christmas eve was to be spent with Jeanette and myself. The family was to be together Christmas day. Dinner was a simple but very satisfying. Hot spaghetti on a cold Christmas eve. While fishing yesterday Mark and I had a few words about the colors of brook trout. 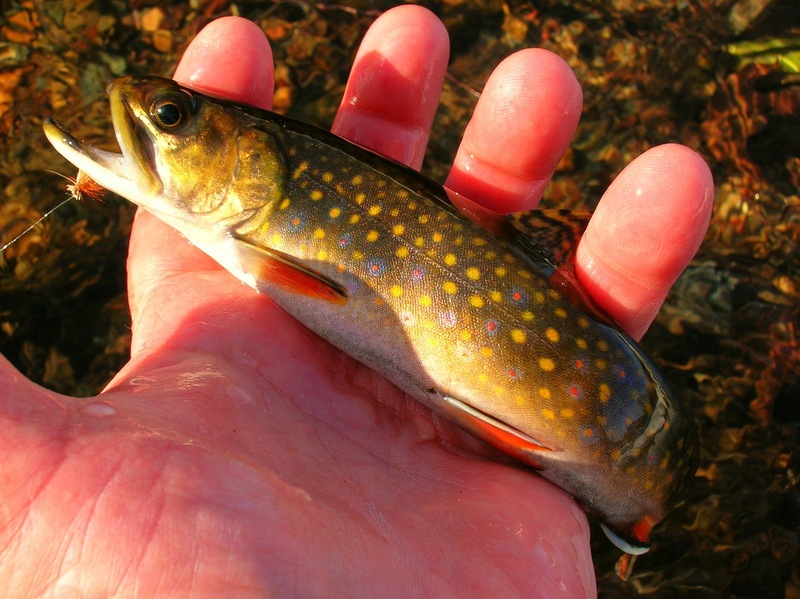 He has fished for brookies in several northeast states, and so have I. We talked about the dark colored brook trout of the Adirondacks of New York, and he showed me a photo of one such brook trout, as well as the type of stream it was taken in. 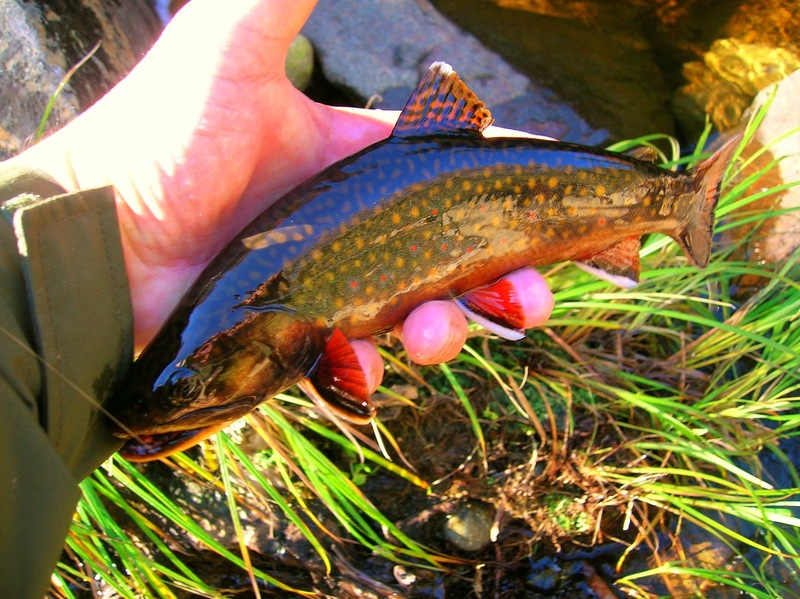 This type of black coloration is also found in several small wild brook trout streams I have fished in Connecticut. I have found that most of these streams have tea colored water. This is caused, so I have been told from the conifers which are prevalent in the streams watershed. This is one of those streams. It's located in far northeast Connecticut. 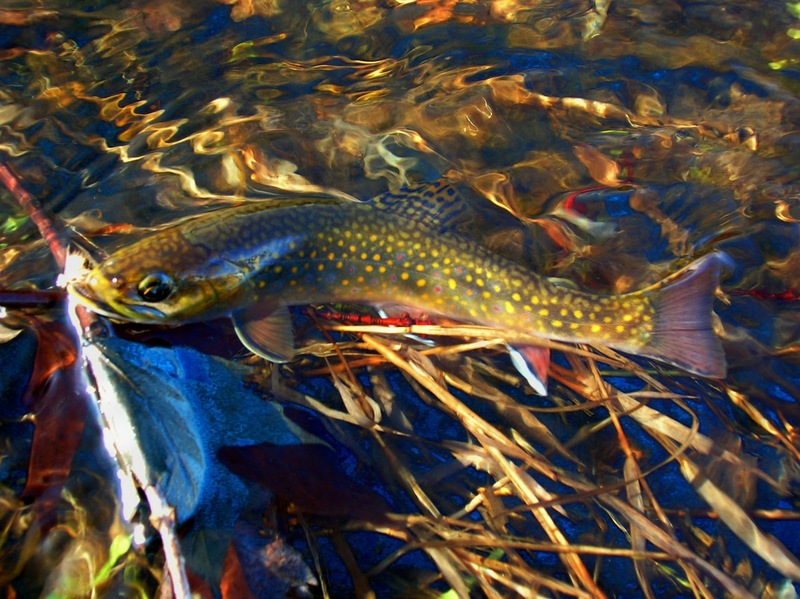 The stream has a healthy population of brook trout. It tends to run warm in the summer but that seems to be not a major problem for the trout, for numbers have been stable since I have been fishing the stream. 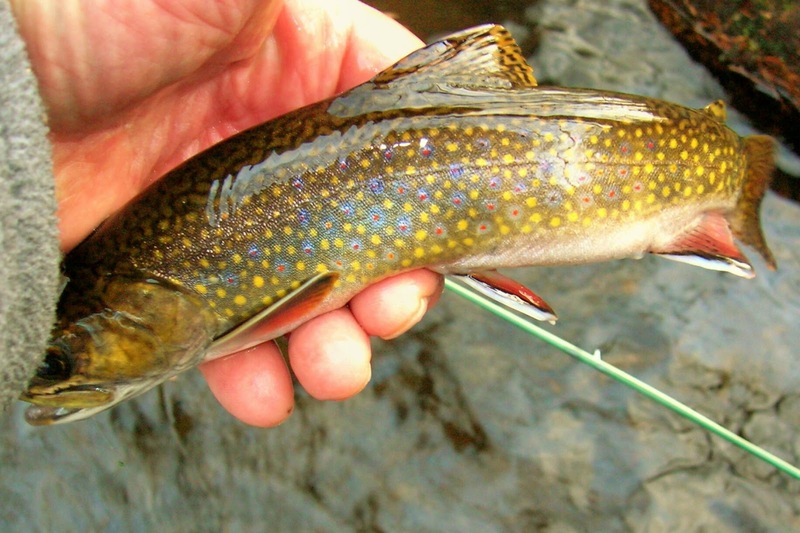 These are a few of the dark colored brook trout I have taken from mid April through June. 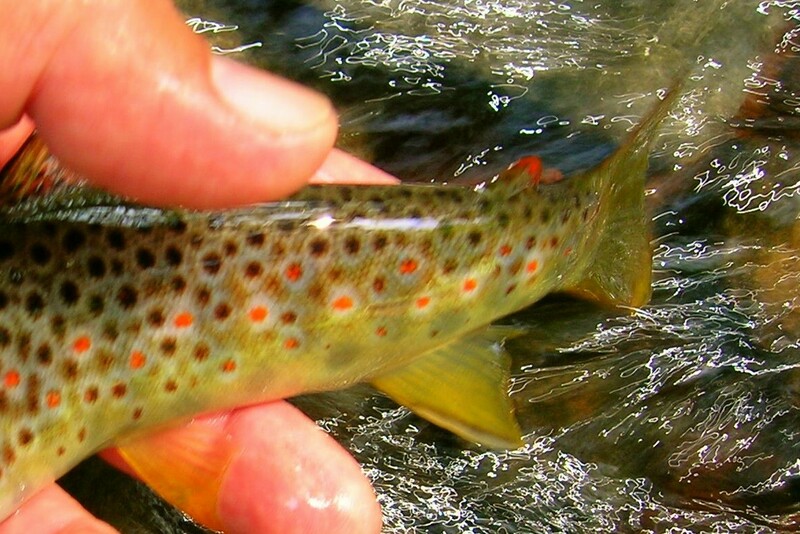 I have never fished this stream in Autumn, "and I don't know why", just to see if they exhibit the bright orange coloration of their flanks as their cousins. These guys showed a "strong" liking to a Red Picket Pin. This past November we were fortunate to harvest a deer. This is one of natures finest creations. Over the years we have enjoyed many a dinner, and these are a few of our favorites. As you can see, venison is very lean meat. This is one of the reasons it must be cooked quickly, and on the medium side. In this dish I have dropped the thinly sliced venison into a skillet with olive oil and a bit of butter. It's then fried for but a few minutes on each side and then plated to enjoy. I season the venison with only salt and pepper, and only when it's in the plate. Venison is a lean meat that cannot take long cooking times. There are some exceptions such as stews, and ground venison. Stuffed green peppers. The filling is venison that I grind, white rice, some whole wheat bread crumbs, grated cheese, and seasonings. Placed in a baking dish with tomato sauce and baked for about an hour and enjoyed. In future posts I'll share with you some other wonderful venison dishes.